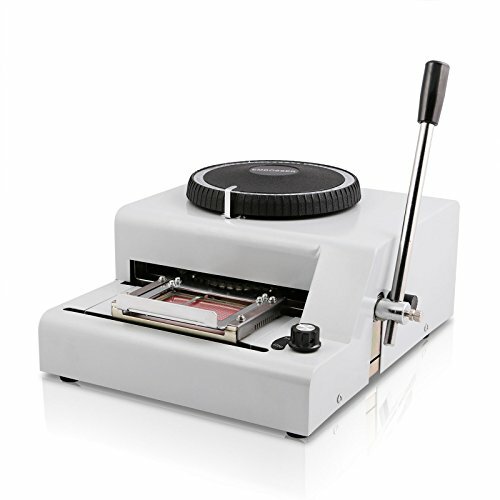 This Card Manual Embossing Machine is the essential equipment of PVC card's post production and processing, which is perfect for personalization of your VIP cards, club cards, membership Cards, gift cards etc. It makes PVC cards identified or exclusive by printing convex characters on them.This Manual PVC Card Embosser Machine we offer has the characteristics of heavy duty reliable structure, accurate orientation ,small volume, beautiful appearance and convenient operation. Compared with electric embossing machines, this manual machine is more economical and better suited for small batch or personalization jobs. 1.Put the card in the card frame and fix it. 2.Move the frame and choose the position what you need. 3.Write the daisy characters plate ,use the pointer to choose the characters you need. 4.After doing step 1~3,jolt the hand-haft. 5.If the embossment depth is out fit what you need,you can adjust the bolt in adjusting hole at the bottom of machine.You can use 4th inner hexagon spanner to untie the bolt,and then use 8th outer hexagon spanner to untie outer bolt,after adjusting,please screw the bolt. If you have any questions about this product by OrangeA, contact us by completing and submitting the form below. If you are looking for a specif part number, please include it with your message.